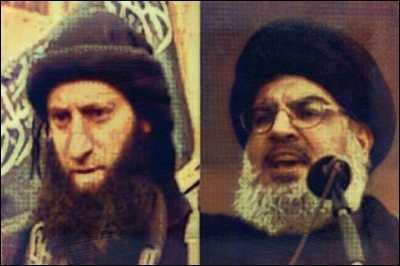 Nusra leader Abu Muhammad al-Julani (left) and Hezbollah leader Hassan Nasrallah don't exactly see eye to eye. The Shi'ite group is currently seeking to shore up its legitimacy by reminding its constituents, and other Lebanese citizens, of the role that gains it the most domestic sympathy – resistance against Israel. It is likely the strike at Mount Dov last week was part of this effort. The Nusra Front is demonstrating its ability to hit at Hezbollah across the border with increasing impunity. Hezbollah, in cooperation with the Lebanese Armed Forces (LAF), managed to stem a bombing campaign by the Sunnis in the Shi'ites' heartland of southern Beirut in the middle of 2013. And tensions between Hezbollah supporters and the local Salafi leader Sheikh Ahmed al-Assir in June 2013 ended in pitched battles and the destruction of Assir's local power. The Nusra Front then struck back hard in an operation whose stated goal was to "avenge Syrian refugees whose tents were burned" during the crackdown on Arsal. The attack wasn't directed against the LAF, but against Hezbollah's positions. The Nusra Front overran a Hezbollah position, killing at least 11 of the movement's fighters. The fight for Qalamun has turned into a grinding affair for Hezbollah, costing the lives of many of its fighters, while it never quite seems to end. The Britel losses indicate the failure of the pro-Iranian bloc's efforts to finish this fight, and show that the direction of events, for now, at least, are in the Nusra Front's favor. As its casualties in the seemingly unending Syrian war continue to mount, Hezbollah needs to redouble efforts to explain to its constituency why this sacrifice makes sense and how it fits into the movement's more familiar justifications for its existence. Nasrallah paid a rare visit to Bekaa this week. In his speech, he sought to link the fight with the Sunni jihadis to Hezbollah's war with Israel. "Victory will be the ally of the mujahideens in their fight against takfiri [apostate Muslims] and terrorist groups, the same way it was their ally in the confrontation against the Israeli enemy," Nasrallah said. Interestingly, the Hezbollah leader didn't stress the military campaign in Bekaa, but rather boasted of the attack in the Mount Dov area, which he said showed "the resistance, which is always vigilant, will protect any attempt to attack Lebanon or its people." These statements and claims notwithstanding, the main concern for Hezbollah and its supporters is the effect that the Nusra Front's offensive into Lebanon is having on the delicate balance between the Sunnis and Shi'ites in the country. The Shi'ites, because of their political and demographic strength, achieved a clear dominance. The underlying concern of recent events is that this balance may be shifting. Hezbollah appears to be aware of this threat and is currently attempting to formulate its response to it. This is a new and emerging front in the sectarian war that has already consumed Syria and Iraq. It remains to be seen if the Shi'ite Islamists of Lebanon will succeed in resisting the challenge from their Sunni opponents.